This chair is waiting for you! We invite you to enjoy the Ashland Hawk Watch and help us scan the skies for hawks, eagles, falcons, and many other species of birds. These numbers are dictated by the migration of Broad-winged Hawks that come through in September. This year has been excellent, with 12,020 counted. In some years, Broad-winged Hawks migrate to our west in the mountains, and we don’t get as many. 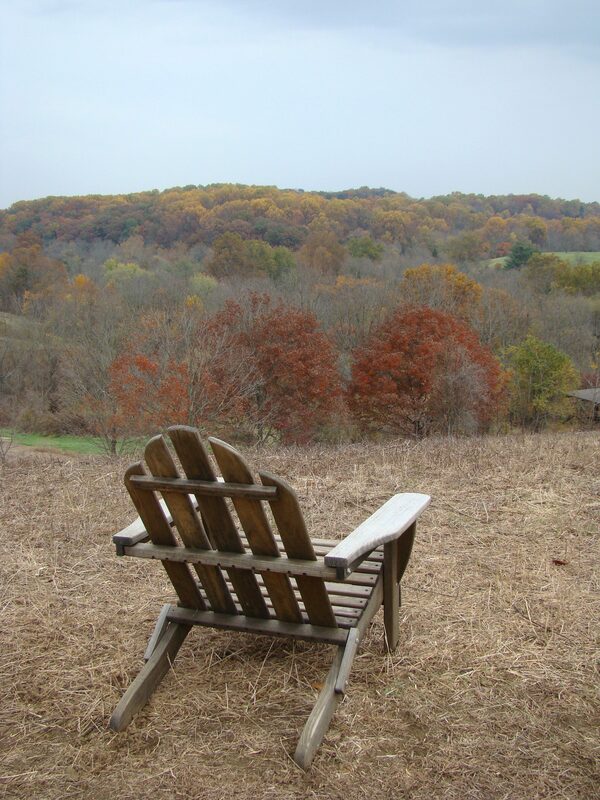 This year, they concentrated their migration through the Piedmont, where Ashland Hawk Watch sits. 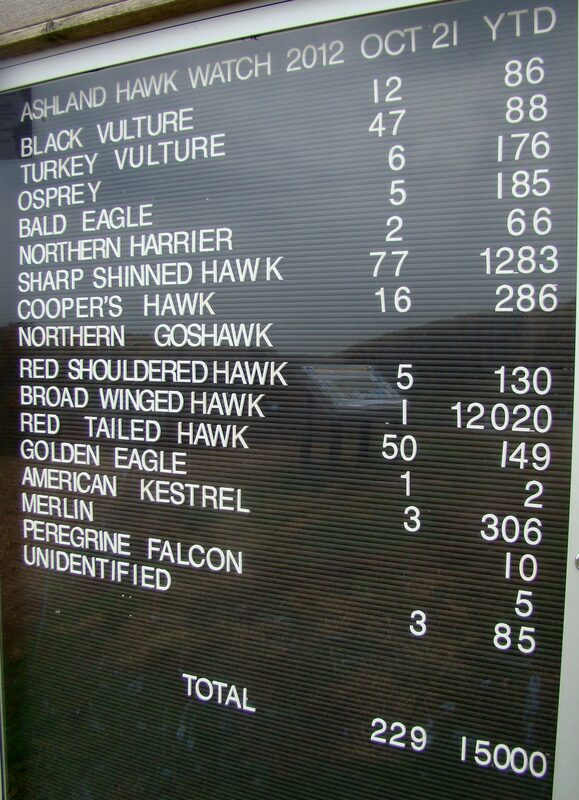 The tally board at Ashland Hawk Watch displays the migration of raptors here through the fall and is updated daily. Now is a good time to visit the Ashland Hawk Watch. On a day with winds out of the north, you may see lots of Sharp-shinned, Cooper’s, Red-tailed, and Red-shouldered Hawks with some Bald Eagles, Northern Harrier, American Kestrel, and Merlin mixed in. 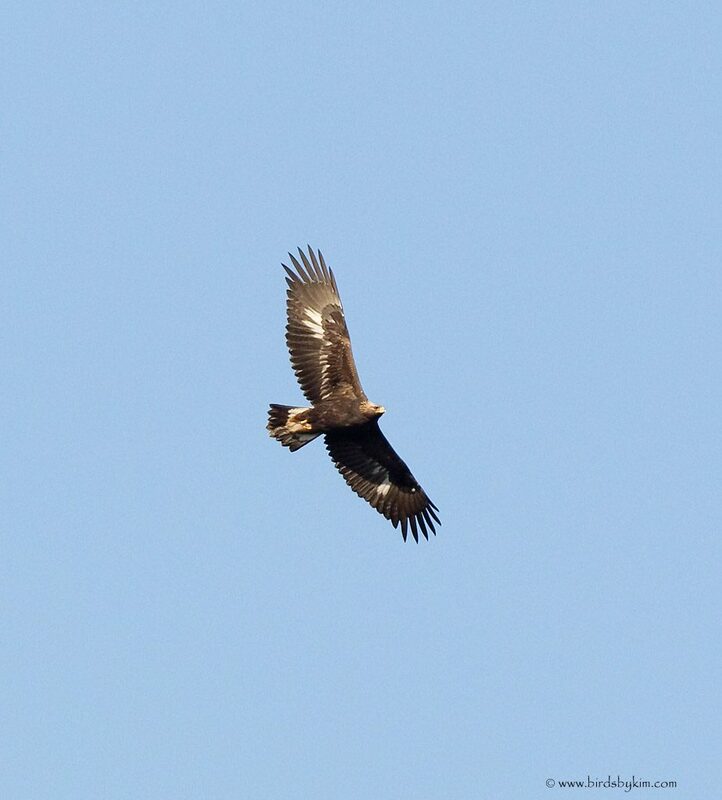 The big highlight this past week has been the arrival of our first Golden Eagles. These huge raptors that breed in wilderness areas of northern Quebec and Labrador migrate through our area in small numbers. If you are lucky, you might see one at Ashland over the next three weeks. Other interesting birds regularly being seen at the hawk watch bird feeders are Purple Finches and Pine Siskins, northern birds that are not seen here every year. The Ashland Hawk Watch is responsible for recording all raptor species that pass by in their migration and our data is sent to the Hawk Migration Association of North America. Additionally, we record the height that all birds are flying by, and this data is sent to the Delaware Department of Natural Resources and Environmental Control, Natural Heritage Division. The Ashland Hawk Watch as well as our southern counterpart, the Cape Henlopen Hawk Watch, is a cooperative program between DNREC, Delaware Nature Society, and the Delmarva Ornithological Society. Come visit the Ashland Hawk Watch any day of the week through the last day of November, but especially when the winds blow out of the north. Keep your fingers crossed for one of the rare Golden Eagles, and experience the beauty of autumn in the golden and red foliage of the surrounding hillsides. Witness the season pass right before your eyes in the form of migrating talons, feathers, speed, and beauty…the raptors. 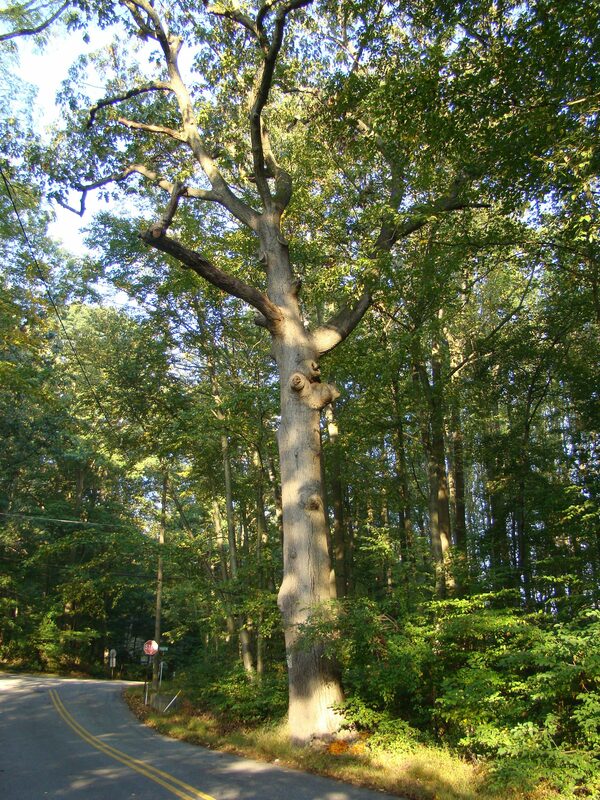 This very large Northern Red Oak sits along Bucktoe Road, New Garden Twp,. PA on the Bucktoe Creek Preserve. Across the street from where I live is a huge Northern Red Oak I admire on a daily basis. In the fall of the last several years, this big tree sports a ring of big, bright orange mushrooms growing in clumps near its base. This year, I decided to figure out what they are. A search through my Peterson Field Guide to Mushrooms indicated that I had found the Jack O’Lantern. Jack O’Lantern mushrooms are poisonous, glow in the dark, grow around oaks, and generally indicate that the tree is in poor health, and may be a sign of heart rot in the tree. It also contains a natural toxin called Irofluven that is being tested for its ability to treat cancer tumors. The Jack O’Lantern smells good, and even supposedly tastes good, but is poisonous because it contains a muscarine toxin. Here is a description of what might happen to you if you eat these mushrooms and get a good dose of muscarine: The symptoms start early, after one-quarter to two hours, with headache, nausea, vomiting, and constriction of the pharynx. Then salivation, lacrimation, and diffuse perspiration set in, combined with miosis, disturbed accommodation, and reduced vision. Gastric and small bowel colic leads to diarrhea, and there is a painful urge for urination. Bronchoconstriction leads to asthmatic attacks and severe dyspnea, and bradycardia combined with marked hypotension and vasodilation results in circulatory shock. Death after 8 to 9 hours has been reported in about 5% of the cases, but can be avoided completely by prompt diagnosis and treatment with atropine. (Waser, 1961). As unpleasant as this sounds, there have been cases where people have eaten this mushroom not once, but twice! Instead of eating the Jack O’Lantern, I suggest admiring its beauty both day AND night. 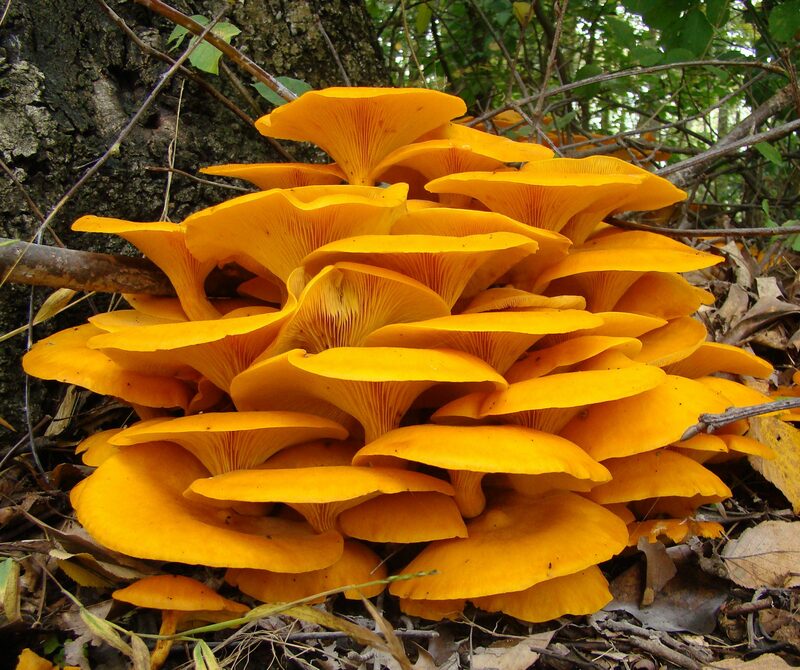 During the day, the beauty is obvious, with its eye-catching, blaze-orange layers of gilled fungi. At night, the gills of this mushroom become faintly bioluminescent, emmitting a greenish glow. By the time I learned this, the ones across the street from my house had started to rot, and lost their bioluminescent qualities. The suggested method to see them glow is to get your eyes adjusted to the dark, and then go take a look. Other people have tried sitting with them in a dark closet until they glow. If you try that, let me know how it works. Back to the huge oak tree where the Jack O’Lantern is found near my house. Unfortunately, these mushrooms indicate that this fabulous tree may be in poor or declining health, and the tree may have heart rot, according to Nancy Fisher Gregory, Plant Diagnostician with the University of Delaware. On a positive note, this mushroom contains a natural toxin called Irofluven that has promise in the medical treatment of cancer tumors. As always with mushrooms, do not eat them unless you absolutely, positively know what they are. Even if they smell good, they might be poisonous, like the Jack O’Lantern. Peter G. Waser; Chemistry and pharmacology of muscarine, muscarone and some related compounds; Pharmacology Department, University of Zurich, Switzerland 1961. Viewed through Wikipedia on October 9, 2012.